This is another project inspired from childhood memories of Christmas and gifts (and Star-Wars). I made up these all this before Christmas, as they were presents - I'm posting details and files now as a how-to-tutorial, I hope you find it interesting and experiment with 3D printed mold making too. It's Christmas 1983 and I have been given yet another Soap-on-a-Rope. Everyone is still talking about the new Star Wars - 'The Empire Strikes Back'. I probably have some Star Wars based presents here somewhere... I keep on unwrapping... Oooh a Transformer, cool. It's Christmas 2015 and everyone is talking about the new Star Wars - 'The Force Awakens' And I know some friends that will appreciate a Soap-on-a-Rope :) Transformers are still doing well too! 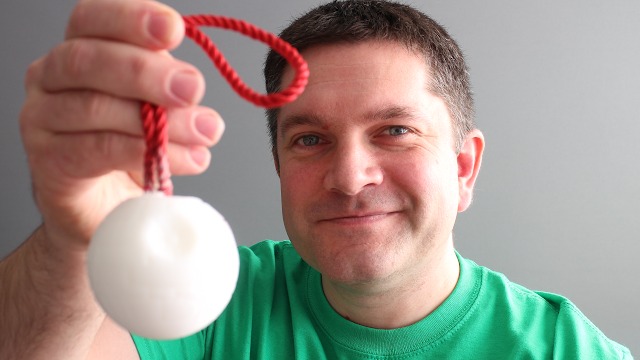 Lets' make lots of them - Using a little 3D Printing magic. For anyone who does not know what a Soap-on-a-Rope is (did you not have a childhood?) 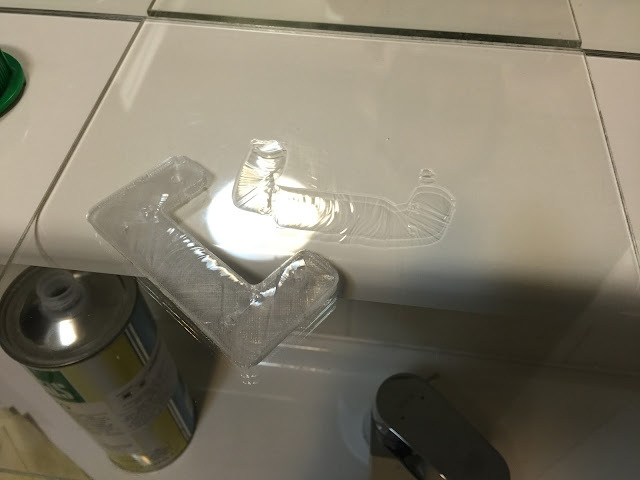 It's basically a soap shaped into an object or character, with a rope loop sticking out the top. They were very popular in the 70's and 80's - they were also very rubbish, lost all features of the 'design' after one use, always dried up and fell apart leaving soap shards or the rope just dropped out). But still, I remember them fondly. The 80's were innocent times, most of the soaps were popular characters of the day or friendly shapes. If you google 'soap-on-a-rope' now - don't blame me for what comes up in the search! I don't know quite why, but I even made a video - check it out below or over on Youtube in HD. 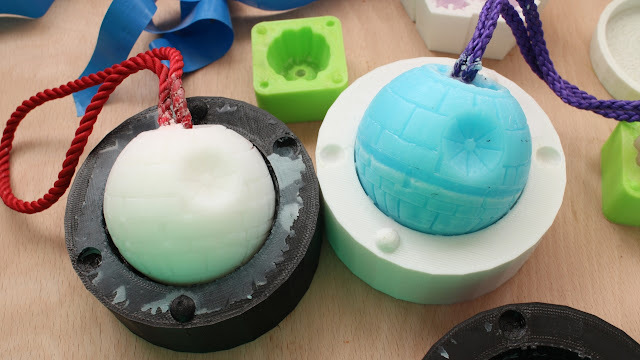 And so my mission was to produce a 3D Printed soap making mold in FilaFlex so I could delight some of my friends with the totally pointless 'Deathstar-On-A-Rope' - the 80's were so great! 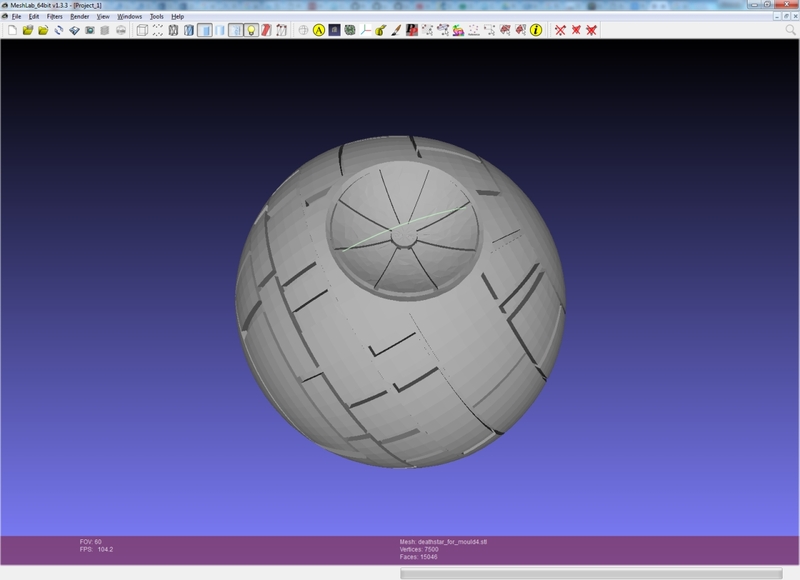 Luckily for Death Star models, we have a nice design already made - Unfortunately many of these models are not manifold (meaning they are not a valid mesh and may have some errors, holes or intersecting triangles) that makes it tricky to further process. So first job was to 'fix the Death Star'. The starting point was the Deathstar Christmas tree ornament by plainolddave - thanks Dave. I checked the model with Netfabb (free) - but that was not able to correct all the problems, so Meshlab was needed to get this model error free. Meshlab (also free) has some powerful model checking and verification tools, these can also clean up your model and fix many common issues. It did not take long to get this model repaired and ready for the next step. 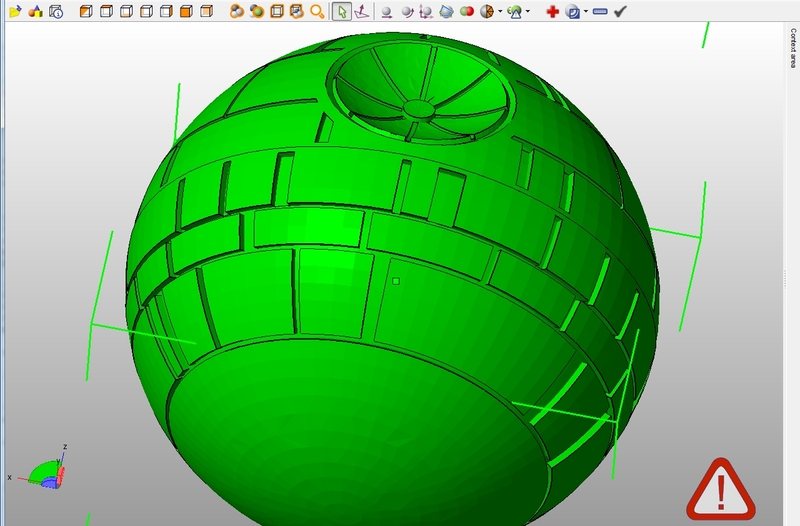 Option 1) - As all 3D model meshes are a hollow 'shell' we can actually cut this Deathstar model in half, put each half in another 3D box and we have a very basic two part mold that could be used. Ideally you also need to add some locating pins and sockets on each half and a pouring hole. 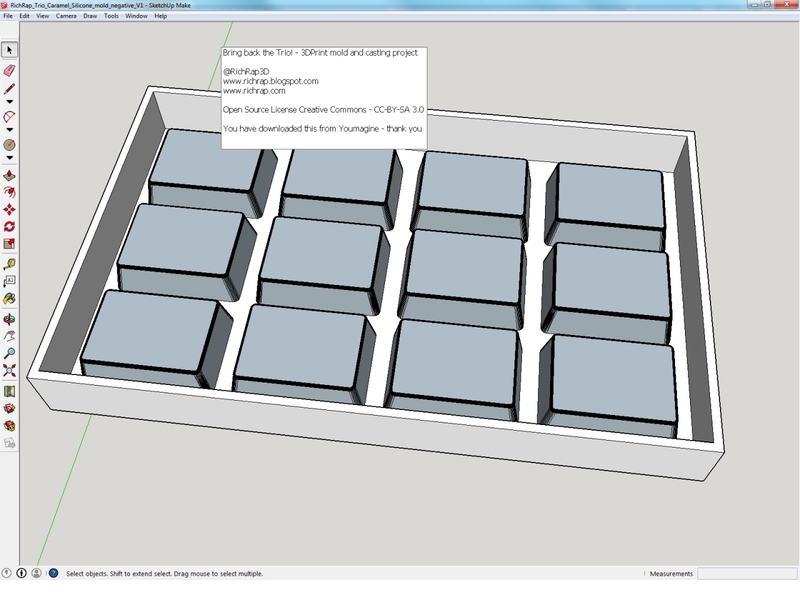 Option 2) (much easier) - Use the rather fantastic - Parametric two-part mold generator for OpenSCAD by Jason Webb - This makes the job of cutting the model in half, adding location pins and a spout for pouring so easy it's almost automatic. You will need to scale the defined numbers in the OpenSCAD script and make a few changes to select sizes suitable for your model file for the mold. You can also select a square or round mold and the location of the pouring hole etc. 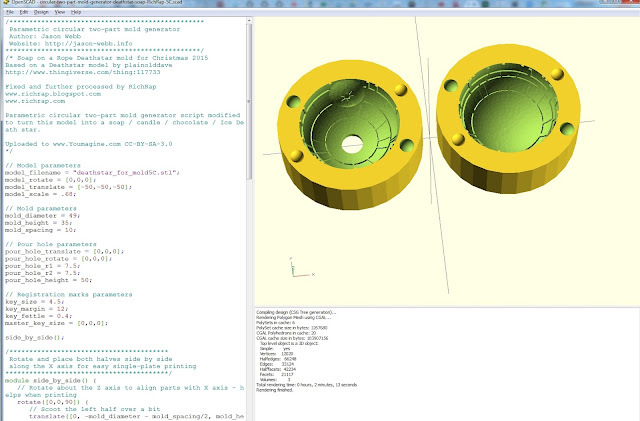 But it's very easy - Just install OpenSCAD, and start by changing the model name being used as the master for the mold. 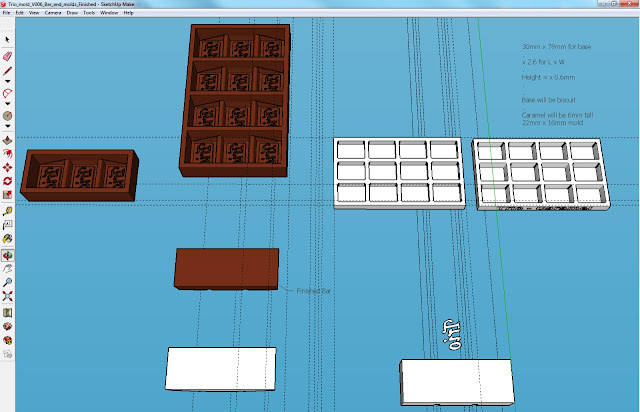 Then you can start looking through the script and altering scale and size to match your object. You really don't need to understand programming, just read the comments in the script and experiment with changing the numbers, I have posted my modified script so you can see what this model required to get the molds correctly aligned. 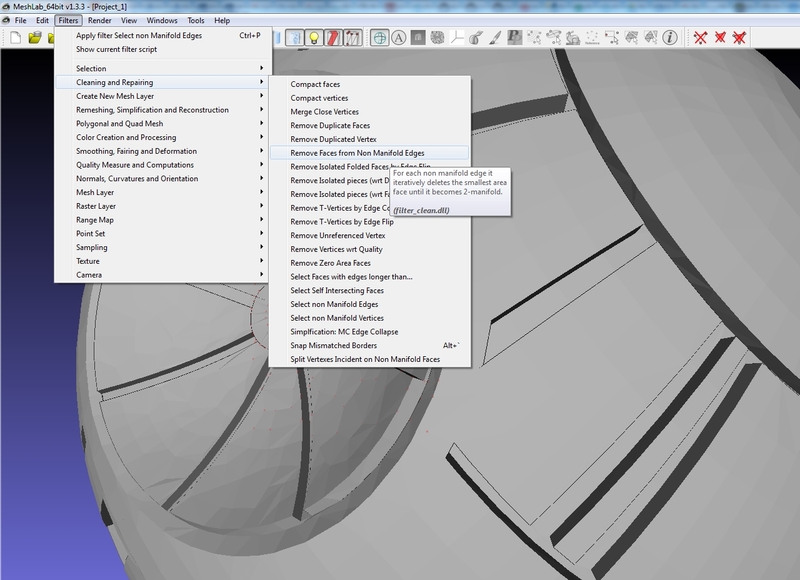 You may find it easier to use Netfabb or another program to rotate or scale the model rather than try to make more significant changes to the OpenSCAD script. Keep things easy and experiment with the values, and you should end up with a two part mold (from almost any other STL model), you can print out and use. 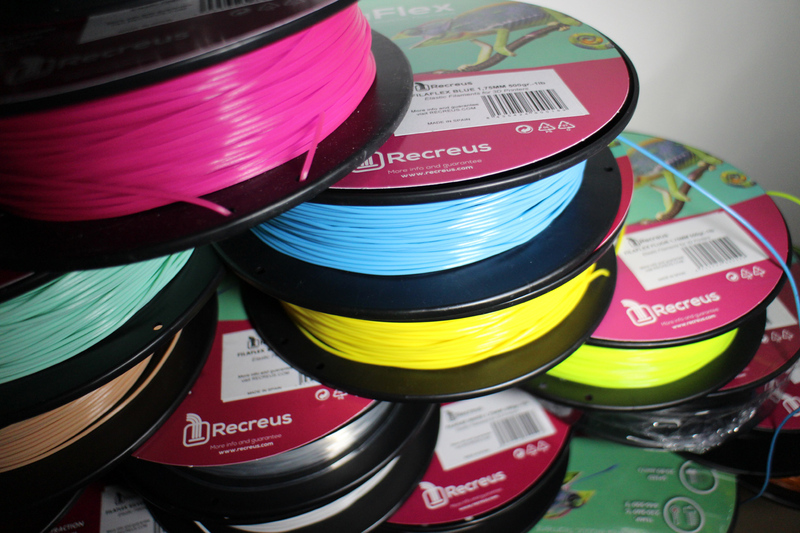 For printing, I strongly recommend using a thermoplastic elastomer (TPU) like FilaFlex from Recreus. This material is flexible enough to allow easy removal, but also holds it's shape well. It's also ideal for temperatures of melted soap, candle-wax and chocolate. 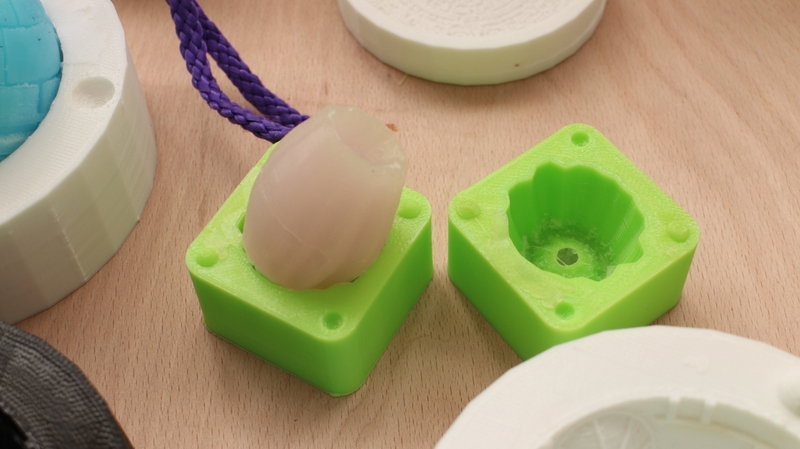 Other TPU's are available - Ninjaflex, Semiflex and soft PLA all can work well for molds. I recommend using the clear, white or a light coloured TPU, I had some very minor staining of the white soap base when testing out the mold using the neon green FilaFlex material. It was not as noticeable when using the clear soap, but you can still see a slight green tint. 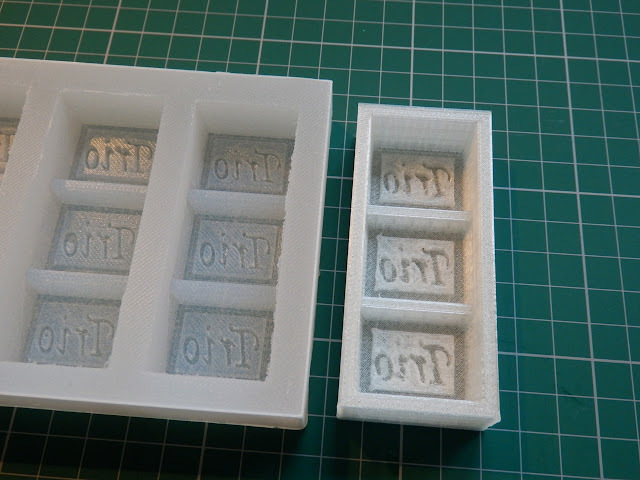 The FilaFlex molds were printed out using a BQ Hephestos V2 3D Printer, as this machine has a very good feed mechanism for soft rubber materials. (it's the best I have found so far). I used a 12% infill and two perimeters with a standard 0.4mm nozzle running at 243 Degrees C and 45mm/second print speed. You could use less infill, but this makes for a strong mold you can use over and over again. 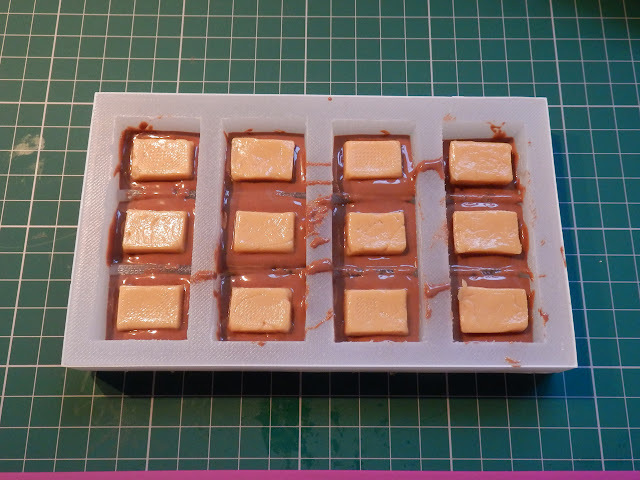 Finally I used easy pour soap, you can buy it in slabs or ready cut into chunks, just heat it up as you would chocolate (but at around 75 Degrees C), and pour into molds. It comes in clear and opaque, the opaque is less tacky and seems to help highlight more details. 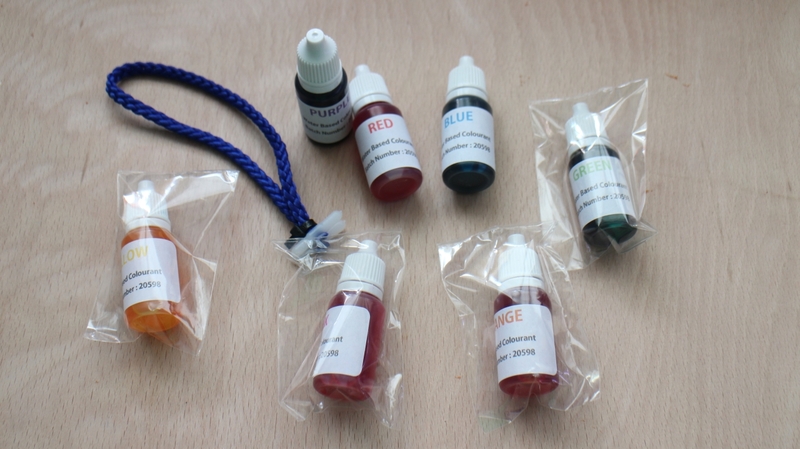 You can also experiment with colour - if you want a grey Deathstar, use equal parts of red, blue and yellow colouring. Consider adding some glitter if that takes your fancy or natural additives like lavender, vanilla, peppermint etc. You can find all the source and model files including the modified OpenSCAD script for this project over on my Youmagine page here. May the force be with washing you! Thanks for reading, please let me know what you think and if you want to see more posts like this. In this post I investigated some common glass build surfaces - Starting with a little history to see how we ended up using borosilicate glass and why that's not always such a good choice for 3D Printing. Many years ago when 3D Printing material choice was more limited than today, enormous amounts of effort went into testing and experimentation of surfaces to print on. Take one look at the RepRap forum archives and you will see that people tried almost every type of material known to man as a 3D printer build surface. 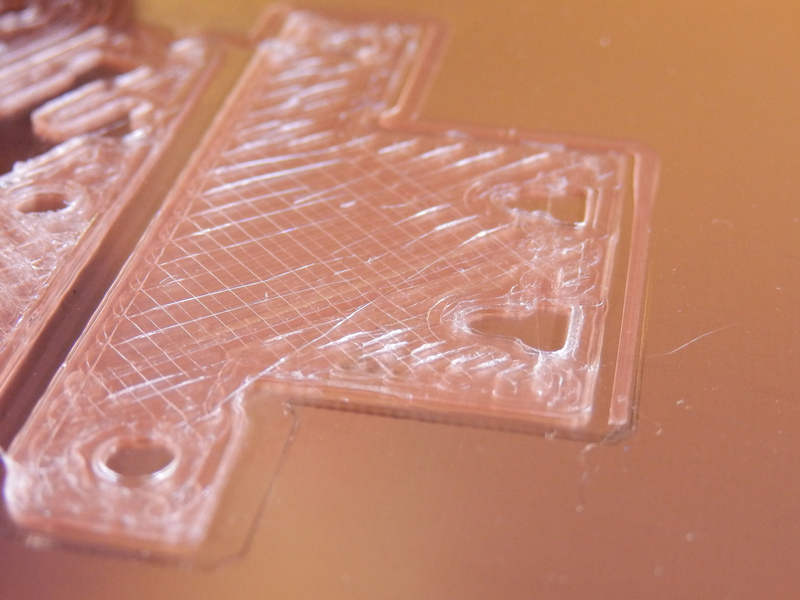 The heated 3D Print bed solved many of these issues, and many people opted for a glass surface to print on. Over the years I have always used standard mirror-glass as my printing surface of choice. I like that you get a reflection - it's easy to see the state of your nozzle. And I found that they heated up evenly and produced fantastic results. 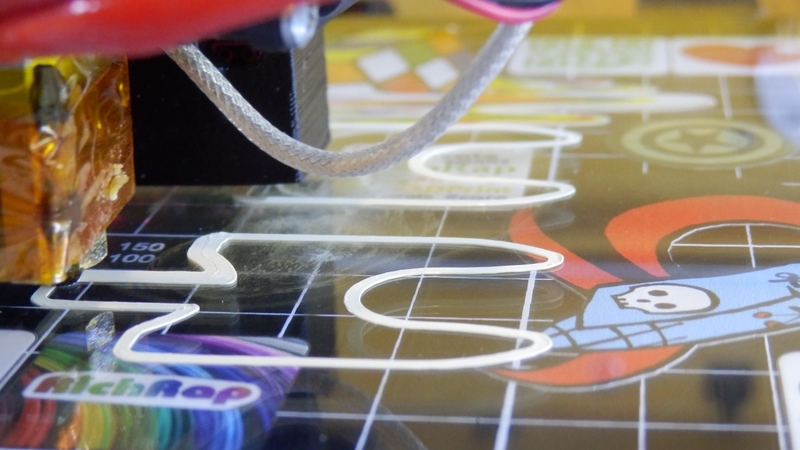 Over time many people have started to specify the use of borosilicate glass surfaces in 3D printers. 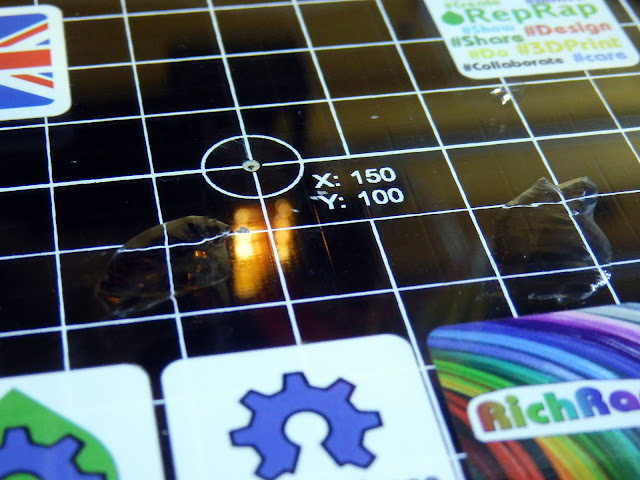 While they do have some good properties and can be ground and polished very flat, they also have some limitations that are not always great for 3D Printing. 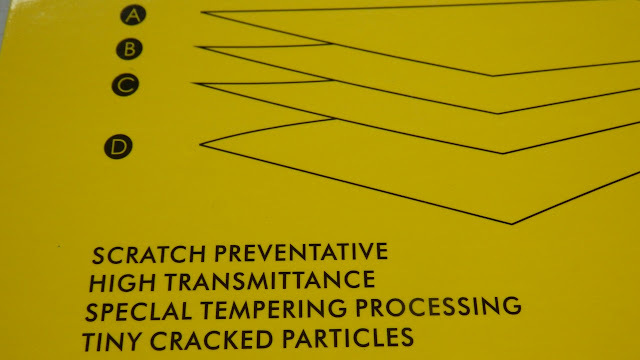 One of the biggest issues of borosilicate glass is that is can scratch easily, you can dig out chips with a metal scraper and generally cause damage just from normal use. I had plenty of damage - even with small parts, borosilicate glass can get chipped easily. 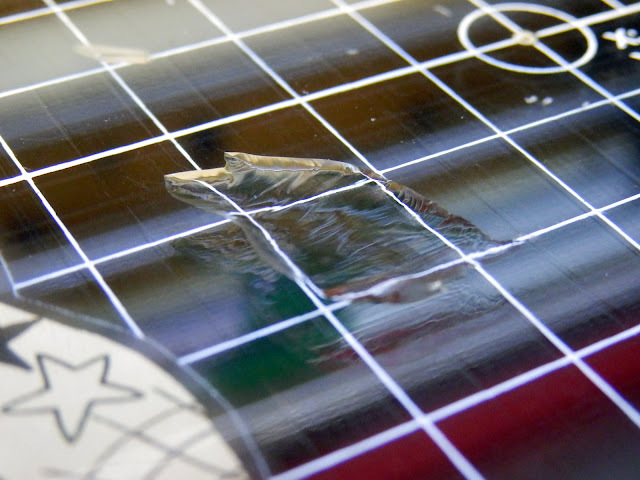 Often the glass chips are also almost impossible to remove from the printed part. Borosilicate glass is also starts to get fragile when it gets damaged, and if you decide to print in PET or many of the filled materials you can take massive chunks out of your glass bed. This problem seems to be something that has not been addressed, other than coating the nice smooth glass surface with uneven gluestick, sprays, sheets of tape or films. I'm at the point where I no longer want to re-coat build surfaces, mess with glue or generally do anything other than clean the glass every 10-15 prints. And for the last few years using the mirrored-glass surface and some standard window cleaner with vinegar that's worked out well. My mission was to find a universal build print surface that can also handle more materials and work with IR detection systems. I have used PEI sheets quite successfully, but they slowly deteriorate and do not seem to like wood-filled and other filled materials. Tufnol was a fond favorite when the first round of Nylon materials were released back in 2011, Taulman Nylons stick well to natural materials like wood, Tufnol, paper tapes and even cardboard. But they all soon deteriorate too. Copper FR4 - PCB material works quite well, but it's hard to keep clean and oxidises very quickly. The only build surface that seems to carry on print after print is glass. But not everything likes to stick to 'normal' or toughened glass. 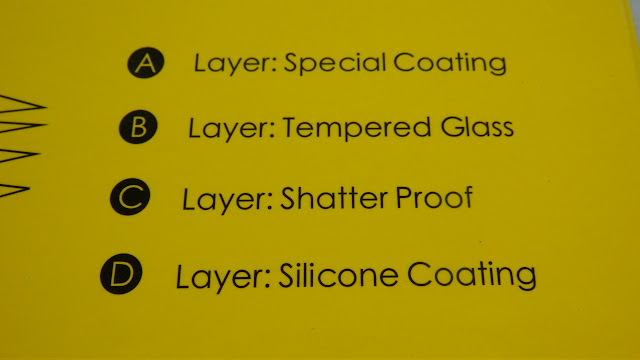 Recently various surface treatments (for glass and other materials) have made it much easier to print with many different materials, but again they all have a limited life and need to be constantly re-coated or patched up. Airwolf Wolfbite is a good example of a great surface treatment I use it on glass for ABS and PCABS. BuildTak is another good sheeting material, and for some 3D Printing plastic's is simply too strong - NEVER, ever try to print with TPU materials onto BuildTak - there is a very good chance they will bond permanently to the sheet forever. Until I had the BigBox I always used standard mirror-glass. Unfortunately because the BigBox used an optical Infra-red (IR) level detection system you can't use a mirror surface. Adding glue, sheets or tapes does make a difference to the IR sensing Z offset, and a change of glue thickness or a missing patch can cause issues. I specifically wanted a clean sheet of glass to print with as many materials as possible - without damage. And that's where the trouble started. My borosilicate glass sheet started getting damaged and with the use of PETG materials became quickly destroyed with missing chunks of glass. It's also quite easy to dig a scraper into the glass and cause a nick or scratch. The issues are not because of bad or low quality borsilicate glass, in fact E3D commissioned an optical instrument company to custom make the sheets of flat borosilicate glass for the BigBox 3D Printer. It's an expensive, and very good quality sheet of glass! But I want a solution that does it all, and has no maintenance apart from a quick wipe down. I was about to buy an A4 sized sheet of toughened glass (300mm x 200mm) and I found sheets of thin glass protectors designed for tablets and phones. ('Gorilla glass' - and many copies that are basically a laminate of toughened glass and probably polycarbonate with some coatings. They are also very thin usually around 0.3mm and have a convenient silicone adhesive backing. The silicone adhesive backing allows it to stick easily to glass without any bubbles. 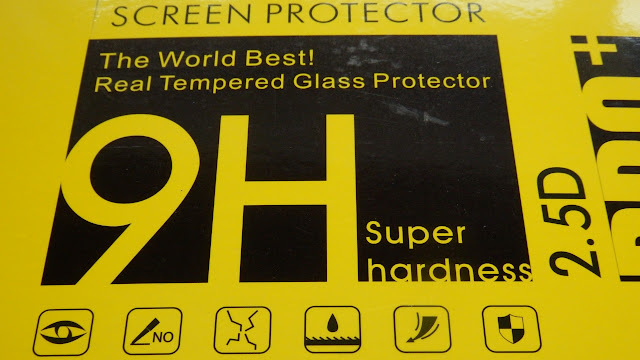 The glass protector is only 0.3mm think - easy to compensate in the Z offset and still allows you to use the other side if you want clean borosilicate glass for other materials. 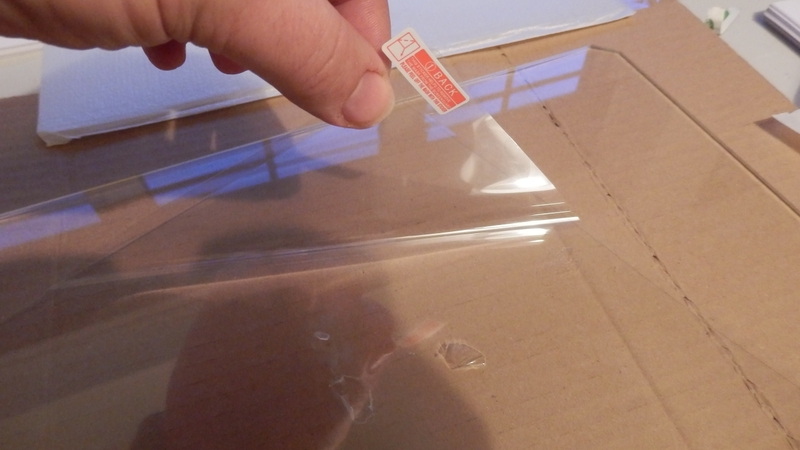 I was concerned that the “Oleophobic” coating they add to these sheets to stop fingerprints and repel oils and almost any type of liquid would stop the thermoplastic extrusion sticking to the sheet. I also wondered if it would bond and not release after cooling down - or worst still totally shatter when using PET/G/T. My borosilicate glass sheet was already damaged beyond use, so I decided to try out a toughened gorilla-glass screen protector. In hindsight this was not ideal because I now have gaps under my laminated sheet, but I'm still using one of the good properties of the borosilicate glass - that it's very flat. Some research into common size protectors and the iPad pro was too big but the Surface Pro4 was almost perfect sized for the BigBox bed (2 ) - I found them on eBay for £7.30 (under $10). From a UK seller including free postage. You can get the exact same thing from China for under $5 with free postage. In short it seems to be a total success - especially for PETG materials - of any size print - in fact the bigger the better. PLA and various filled materials all seem to stick well too. I found that I needed to increase my heated bed temperatures by +5 degrees C and Eureka! - this works. 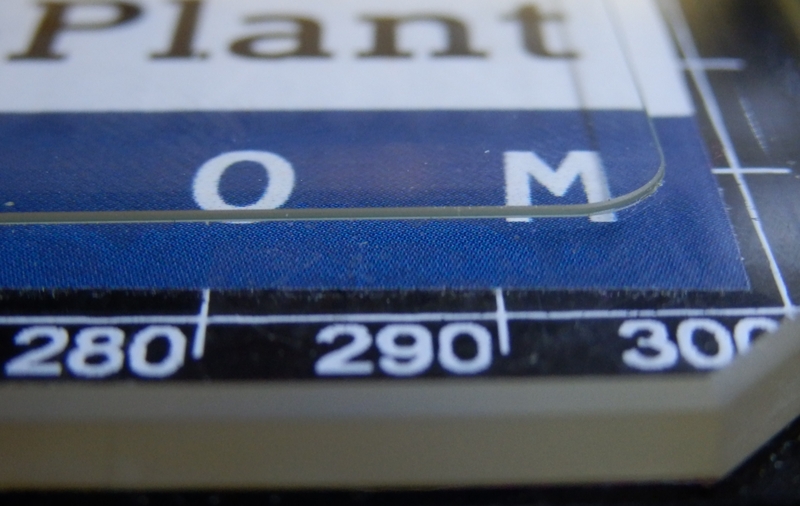 I didn't use a brim with the PETG materials, and some were over 150mm in size with 45% rectilinear infill - (that's nasty and would take great chunks out of my bare Borosilicate glass sheet). The the “Oleophobic” coating should last a very long time, but you need to make sure not to use aggressive chemicals or alcohol based cleaners. It's designed to be easily cleaned with just a dry standard microfibre cloth and nothing else. I also believe that when the coating does start to vanish, that will only help other materials (like PLA) stick just a little better things - time will tell on that. You do get slightly less stick with PLA, so for very small parts (20mm or smaller) I found that a brim was all that was required to keep them stuck. It was more of an issue with transparent PLA's I didn't see any issues at all using Opaque PLA materials. I have not yet done any testing with Nylon or woodfilled / other-filled materials. Other PET (G/T) based materials Like Refil, nGen, _XT and T-glase all seem to work well. Why not use a thick sheet of toughened glass? - Yes you could, but it's often not all that flat and many 3DPrinters now come as standard with a heated borosilicate glass surface. That's great for PLA, and with a 'Gorilla glass' style protector on one side, you can still use the other side for other materials if you need. Please leave me a comment and get in contact. 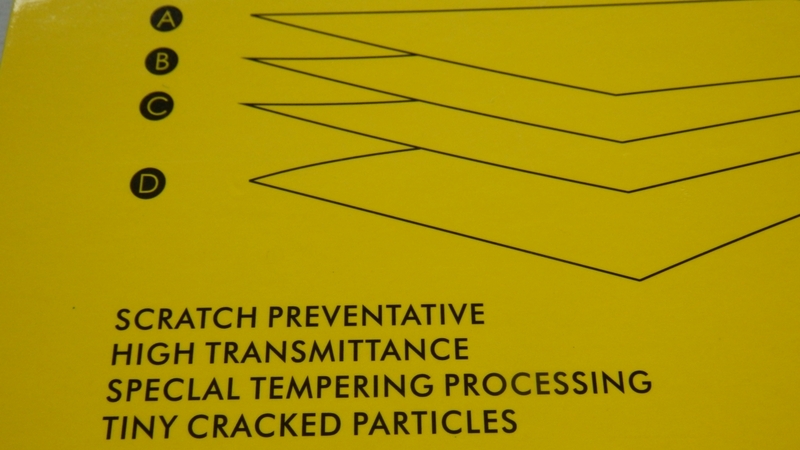 If you try out a sheet of toughened glass - 'protector' do let me know how you get on with it. 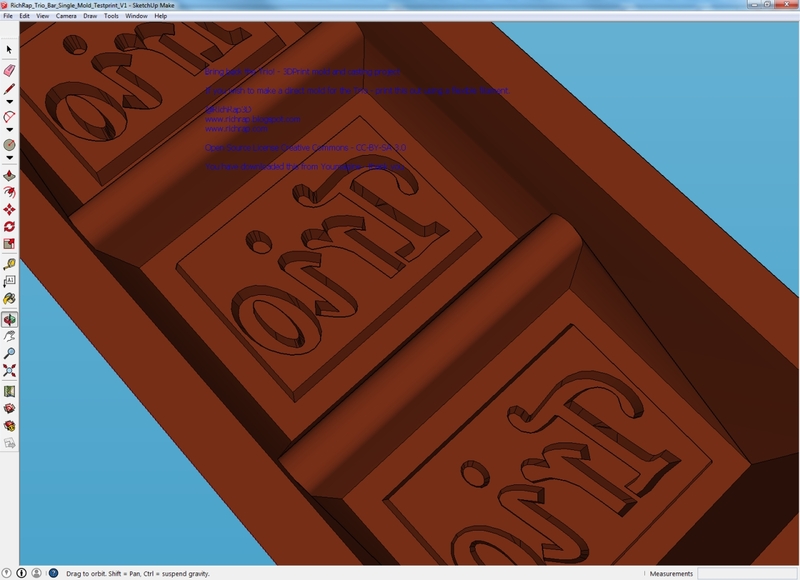 In this post I investigate the use of 3D printing to help bring back a favourite chocolate bar - a taste of nostalgia from the 80's. I did all this back in early December 2015 - just in time for Christmas! 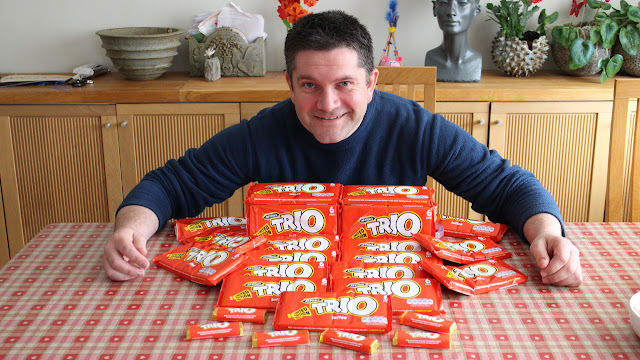 In some rather great timing - literally as I was typing up this post and editing the video - United biscuits (the parent of Jacobs) Today 9th Feb 2016 - confirmed that they will actually bring back the TRIO! - I'm excited as they will be back in the supermarkets in only 1 month. I was rather surprised and delighted by this news - but at least I got to experience my Trio! 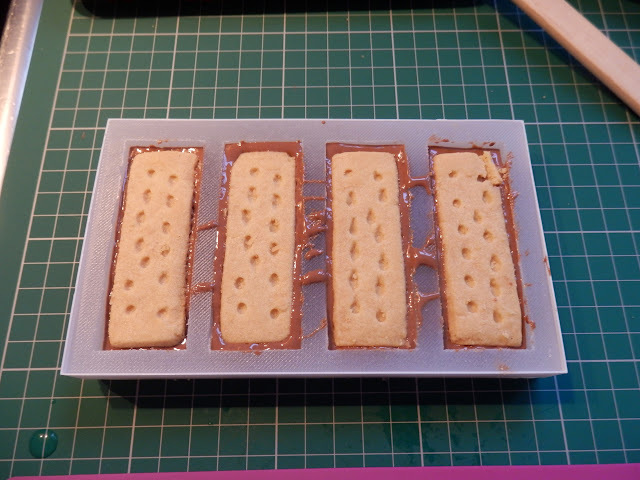 before anyone else, and I can soon compare to the real thing once again - read on to see how 3D printing can help bring back a favourite snack. I want a Trio! and I want one NOW! Chocolate bar's of the 80's were so much more exciting than now. Many companies experimented with new ingredients and combinations, there was a big battle for the next big chocolate snack. Some were good, some were awful and were banished from the shelves very fast indeed. And don't get me started on the Marathon > 'Snickers' name change. One Chocolate bar that was a fond favourite for me was the Jacob's Trio! Trio's are now a thing of the past, they finally died somewhere in the mid to late 90's and unfortunately because Jacob's biscuits has been acquired by another company, they now only really focus on crackers. That's crackers in my opinion as the 30-year cycle of childhood memories is well upon us for this fantastic chocolate snack. Now the only option we have is to attempt to re-create the long lost bar - and that's where a little 3D printing can help. 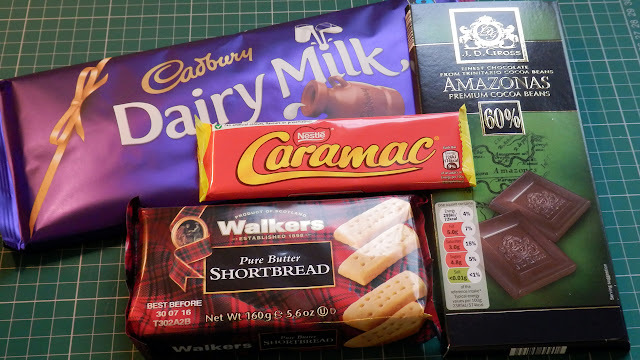 At the point of deciding to do this project, I was also reading a really great book called the Great British Tuck Shop by Steve Berry and Phil Norman. I can totally recommend if it you have an interest or memory for snacks of the 70's and 80's past. They mention the Trio, only briefly. For the mold making - I'm using a great food safe silicone, you mix equal quality of Part A and B. But first you need to design and 3D print your chocolate bar, I'm using Sketchup above to produce both negative molds and also positive chocolate bars. Mix up the silicone, trying hard not to get too many bubbles, using a cutting action helps. Pour and settle - bang it a few times down on the desktop to remove bubbles. 5-6 hours later - after removing the bars you will have a mold ready to use - after a wash and dry first. For the ingredients, I don't have exact quantities, I was winging it for this experiment. You need milk chocolate - I used Cadbury Dairy Milk. (or chocolate of your choice). One Caramac bar to help make the 'toffee' layer. 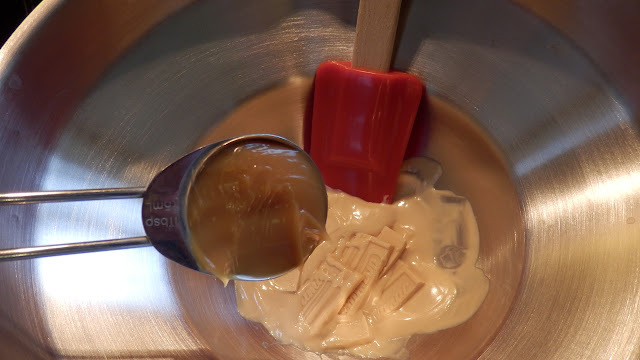 I used 1 table spoon of salted caramel sauce - because my tastes have changed slightly since I was 10 years old :) - (in the US that's probably about 1/24th of a 'Cup' - I'm guessing). By some total accident I found that Scottish Walkers Pure Butter shortcake biscuits are exactly the dimensions we need for a Trio! - and they taste great too. 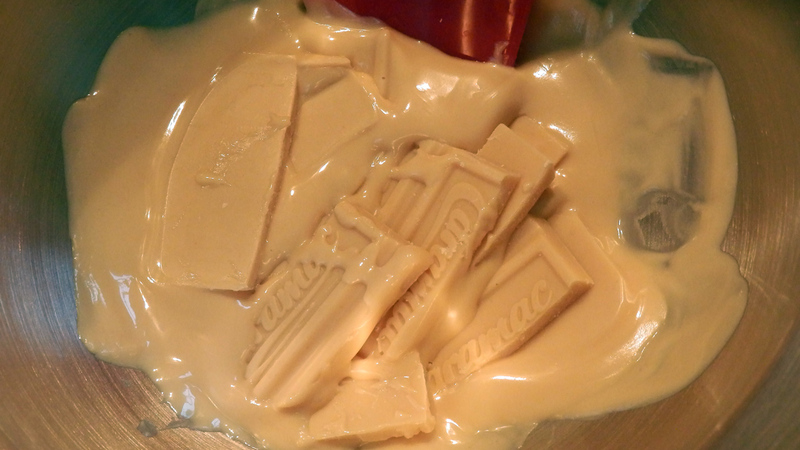 When melting the chocolate and caramac for making the toffee I recommend using a water bath (Bain-Marie) - this helps gently melt things so you don't cook the chocolate or split the toffee. A thermometer or other temperature measuring device is a good idea for keeping track of the melting process. If you want to also temper the chocolate before using it, then maybe practice the art of melting at a higher temperature - around 42 Degrees C and lowering the temperature to around 31 Degrees C before using in the mold. Another directly printed mold in FilaFlex for the Caramel sections of the Trio! 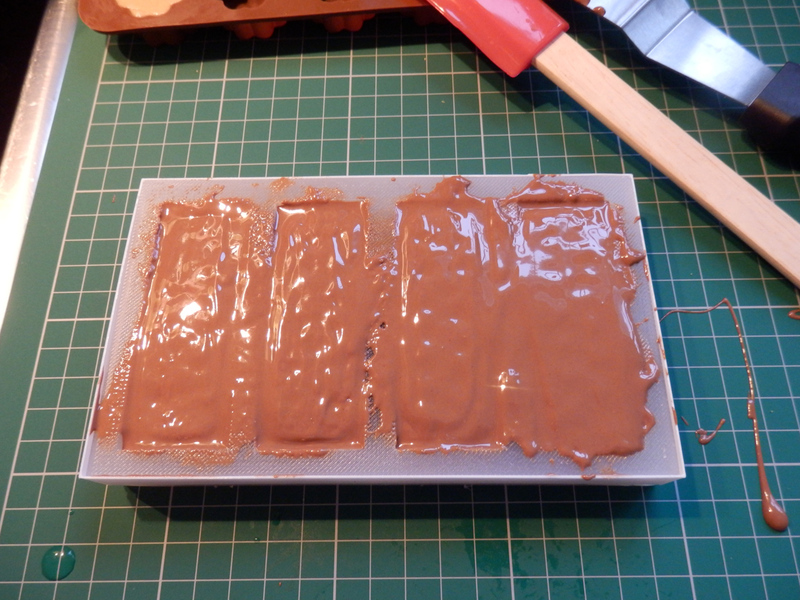 Firstly you want to cast the toffee sections, melt mix and pour into the mold. They will not set hard, as you want a gooey toffee layer in the bar. 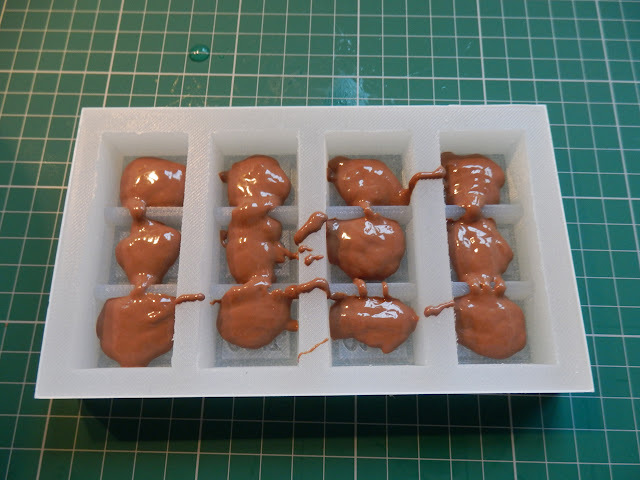 I put them in the freezer to go hard so they were easy to remove from the mold. 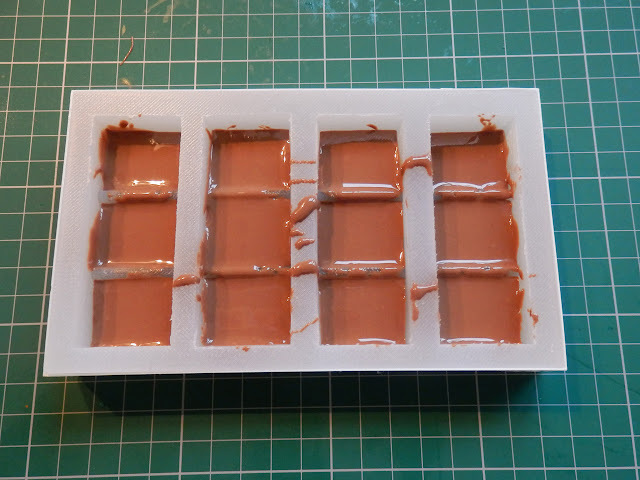 When pouring the chocolate, just focus on getting some in the molds first. And then give them a tap on the table, that will settle, level and release most of the bubbles. You will see that on my Trio! bars I had a few bubbles remaining around the Trio text, so make sure you give them a really good tapping. 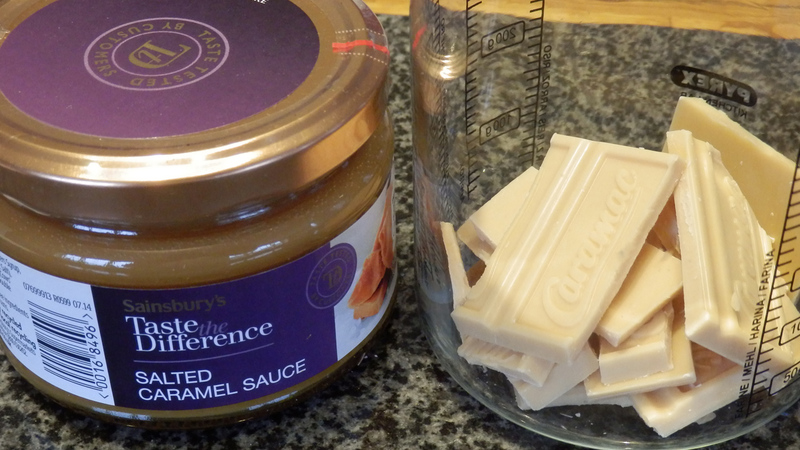 Add the toffee pieces and a little more chocolate, try to make sure the toffee does not move around too much. Then you want to add the shortcake. Depending on how much chocolate you have used, you may need to reduce the height of the shortcake. Finally cover in more chocolate and level off with a blade or spatula. Then eat them all with a nice cup of tea. This is sometimes a confusing area. 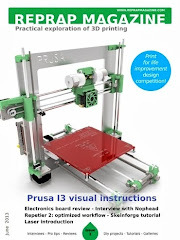 Some materials for 3D printing are being advertised as 'FDA approved' Food and medical 'safe'. That may or not be true in their manufacturing process to make the filament. But please remember that when used in a 3D printer, being melted in a hot-end that may have many other contaminated materials. Along with a brass nozzle that probably contains lead. It's worth keeping in mind that the FDM printing process is not a 'safe' method of producing objects that come into contact with foods or your body. 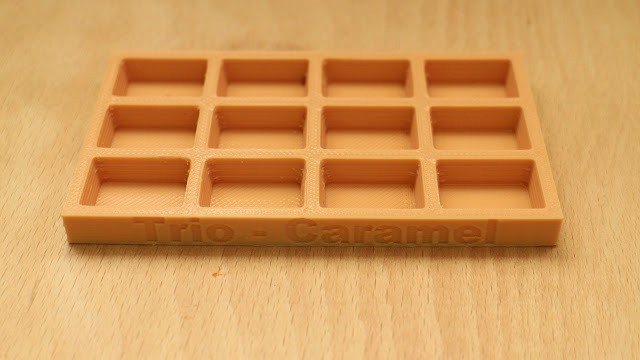 3D Printing out a cookie cutter or even a cup or spork to use once, maybe okay. 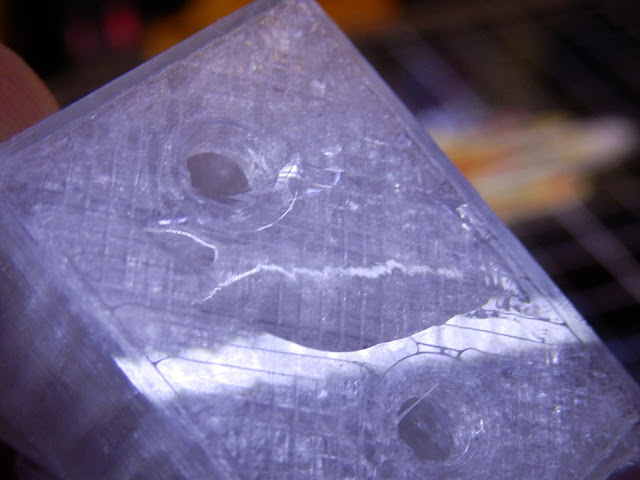 But remember that 3D parts are made of layers of plastic, with lots of indentations, grooves and micro-holes where bacteria can grow or contamination can collect. You also can't just put most 3D printed objects in the dishwasher, they usually melt, deform or discolor. 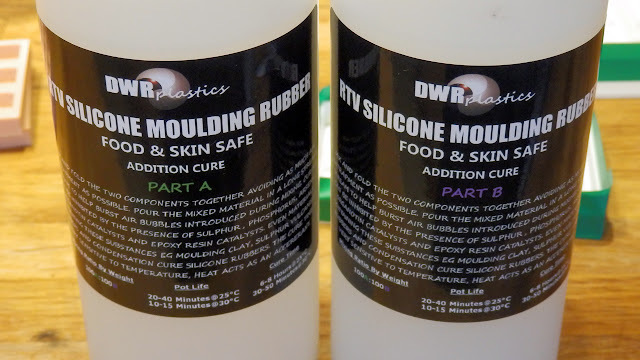 I was and still am investigating the use of TPU - thermoplastic elastomer (polyurethane rubber) for foods and mold making. 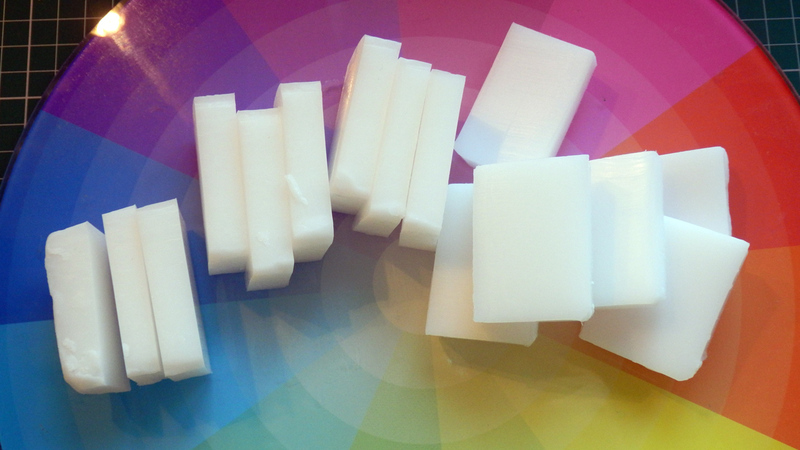 I know I had some colour leak out of a bright green FilaFlex mold when I was doing soap and candle making. (that was at higher working temperatures of around 80 Degrees C) This indicates that it may not be such a great idea to use it directly for food based products. I did make a Filaflex Trio! 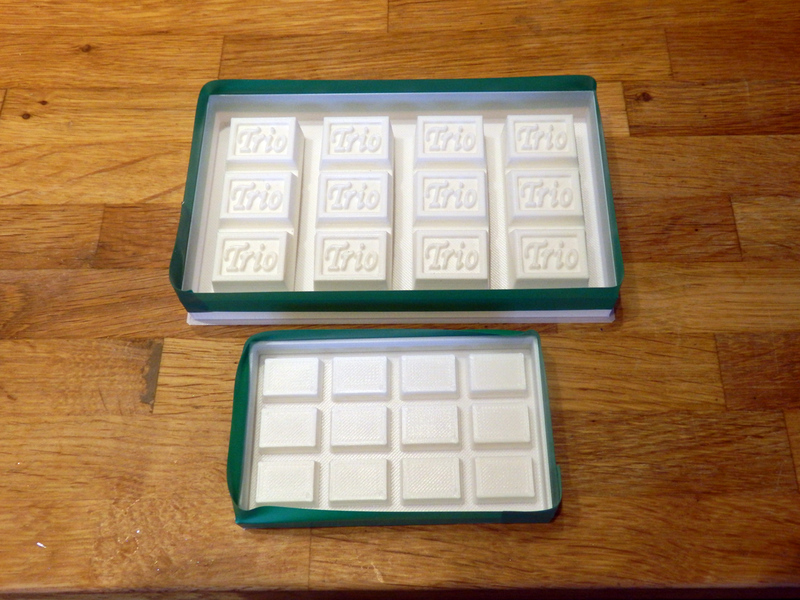 bar mold (shown above on the right), in clear material, but decided to not to use it directly. And as you see above I also used white PLA printed Trio! 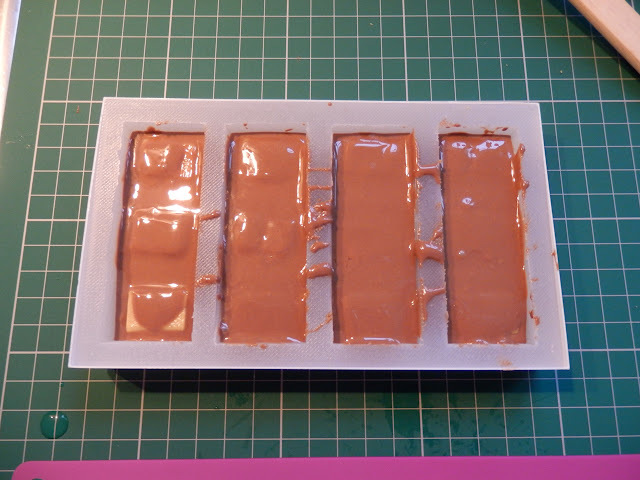 bars to cast a food-safe mold. I feel happy with PLA as it's only in contact for a short time while the mold sets (5-6 hours) and the mold can be fully washed out with warm soapy water before and after use. Other flexible materials are also available, Ninjaflex, Semiflex and plasticized (soft) PLA. You can buy FilaFlex from Recreus. This material is flexible enough to allow easy removal, but also holds it's shape well. 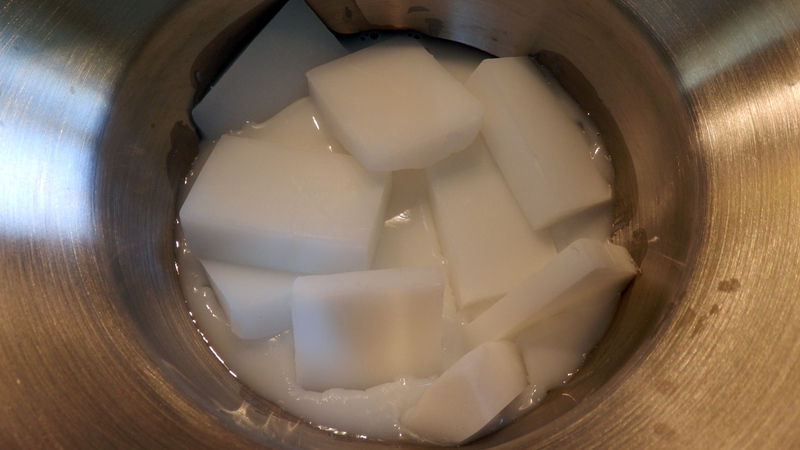 It's also ideal for temperatures of melted soap, candle-wax etc. As ever, be aware and make up your own mind before using 3D printing for food or body based projects. You can find all the source and model files for this project over on my Youmagine page here. Thanks again for reading, please share and feedback on this project or anything else I'm doing. Until next time, I have three more Trio! bars to eat, and no you can't have one. 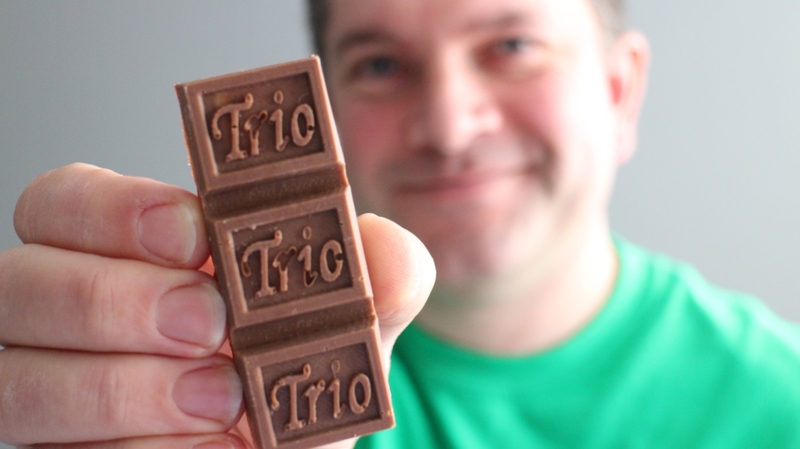 And remember to look out for REAL Trio! bars back in the UK shops in March 2016 - Can't wait!